* Organizing sessions are based on services rendered, ranging in hourly fees of $50-$75. * Monthly Personal Assistant Plans are available in flat fee increments, starting at $100. Garrison Concierge does not offer the services of car rides or babysitting. **Please note that in Madeleine’s 19-year experience in the organizing industry, she has had a wide range of clients from those who have simple situations to those who have very special needs and overwhelming challenges. She has worked with clients having emotional or physical impairments, senior citizens with new or extended challenges as well as high profile executives and celebrities. She has nearly 200 hours of specialized psychology classes through ICD that are specific to the varied challenges of organizing the spaces, time and general lives of clients– case by case. Garrison Concierge offers on-site consultations to inspect home environments, noting areas that may need improvements for a healthier lifestyle. GREENGANIZE! (official GC term for green organizing) : This services promotes the growing interest in “going green”, by gradually adapting healthier habits which will also help the environment. It can be as simple as buying organic produce to as complex as going zero waste. Garrison Concierge can get you to the level you choose to improve. ~ pet care NOTE: Garrison Concierge will no longer be able to accept new pet clients at this time. Pet services will be phased out entirely by July 31, 2018. 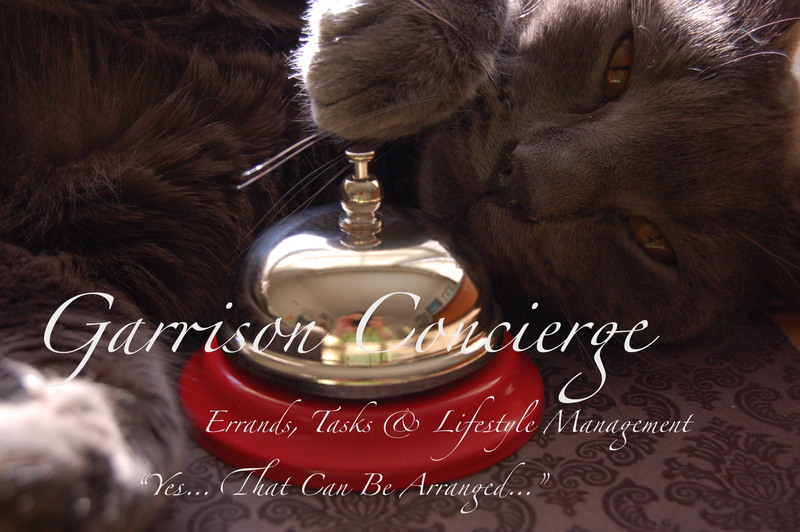 PET CARE — NOTE: Garrison Concierge will no longer be able to accept new pet clients at this time. Pet services will be phased out entirely by July 31, 2018.